Child care reform occupies an increasingly prominent role in U.S. policy debates. There is widespread concern that the U.S. early care and education system, on which a majority of families with young children rely, is inadequate and falls far short of systems in our peer countries. Because children’s experiences in the first five years of life establish the foundation for ongoing learning and progress, high-quality early care and education for all children is critical (IOM and NRC 2015). That is why many peer nations provide universal affordable child care through subsidies, extensive prekindergarten programs, and paid family leave. In contrast, the American system for the provision of early care and education is deeply fragmented and severely under-resourced, which results in vastly uneven quality of and access to services. This report was produced in collaboration with University of California Berkeley’s Center for the Study of Child Care Employment. This fragmentation comes out of our century-long tradition of separating “care” from “education” as if they are distinct activities that do not occur simultaneously. And because public funding for early care and education is limited in the U.S., the cost burden of early care and education is borne primarily by parents and by the early childhood workforce in the form of their low wages. The destructive rise in income inequality in recent decades has both compounded the problem of inadequate early care and made it more urgent to address. Rising inequality over the past four decades has meant sluggish wage growth for most American workers (Gould 2017). That means families have less to invest in high-quality child care and early education. And because lower income families have less access to paid family leave than higher income families, these families are less able to provide that high quality care and education themselves. This combination of economic inequality and disparate access to high-quality early care and education is at the root of achievement gaps between children from high- and low-income families. These gaps persist and perpetuate inequality. Does the policy allow all parents the option to stay home with their infants, newly adopted children, or new foster children? Does the policy relieve the cost burden of early child care and education for low- and middle-income families? Does the policy improve quality by investing in the early care and education workforce? 3. Solutions that do not sufficiently or effectively address each of the above questions should be disregarded. The difficulties of achieving high-quality care for America’s children are widespread and multifaceted, but can be boiled down to three major problems: lack of resources for parents to stay home with very young children, lack of access to affordable care and education, and low and uneven service quality of early child care and education options. In summary, parents too often lack viable options: both staying at home and going to work are unaffordable. Adequate leave that makes it feasible for parents to stay at home with their young children is an essential component of early care and education systems around the globe (OECD 2016). Yet in the United States, far too many parents lack the option to stay at home with their young children at their earliest stage of life because of insufficient or nonexistent paid family leave. The Family and Medical Leave Act (FMLA, the first law President Clinton signed in 1993)1 provides up to 12 weeks paid family leave to eligible workers, providing access to an estimated 56 percent of the workforce (Jorgenson and Appelbaum 2014). While eligibility for FMLA is limited based on size of firm and tenure at job, a separate survey of employers, the National Compensation Survey (NCS), reports that 87 percent of workers have access to some amount of unpaid family leave (BLS 2016).2 But NCS reports that only 13 percent of workers have access to any paid family leave (BLS 2016). Unpaid leave provides valuable job security, but it doesn’t help parents pay bills or avoid the sharpest trade-off involved in deciding to stay home: loss of income versus paying the cost of outside care. Further, the distribution of workers with paid family leave is skewed toward higher-wage workers. As shown in Figure A, workers in the top 10 percent of the wage distribution are six times more likely to have paid leave to take care of their young children (newborns, newly adopted children, or new foster children) than workers in the bottom 10 percent. National paid family leave policy can level these disparities and give parents across the wage distribution the ability to stay home with their newborn, adopted, or foster children. High-quality child care is out of reach for many American families—not just those with low incomes. Most families pay out-of-pocket for some portion of child care costs (including preschool or prekindergarten). The average fee for full-time child care ranges from $4,000 to $22,600 a year, depending on where the family lives and the age of the child (EPI 2016). According to the Economic Policy Institute’s “Cost of Child Care” interactive fact sheets, child care costs are one of the most significant expenses in a family’s budget (EPI 2016). Among families with two children (a 4-year-old and an 8-year-old), child care costs exceed rent in 500 out of 618 communities (“family budget areas,” as designated by the Economic Policy Institute, which encompass the entire U.S.) (Gould and Cooke 2015).3 Child care consumes so much of a family’s budget largely because child care and early education is a labor-intensive industry, requiring a low child-to-teacher ratio (Child Care Aware of America 2017a). The Department of Health and Human Services has historically considered child care affordable if it consumes 10 percent or less of a family’s income (but has recently reduced this threshold to 7 percent) (U.S. HHS 2014; 2015). Affording child care is particularly difficult for low-wage families. For a full-time, full-year minimum-wage worker, child care costs as a share of income far exceed even the less stringent 10 percent affordability standard. For example, the shares of annual minimum-wage earnings required to afford center-based infant care range from 31.8 percent in South Dakota to 103.6 percent in Washington, D.C. (Bivens et al. 2016). This expense becomes even further out of reach for families with more than one child requiring care. However, the cost of child care is not just a problem for low-income families. By the 10 percent metric, infant care is “affordable” for the median family in only two states—South Dakota and Wyoming. In Massachusetts, which has one of the highest center-based infant care costs, child care costs exceed this affordability test for over 80 percent of families. This is illustrated in Figure B, which depicts the share of families able to afford infant care in each state. Similarly, Figure C displays the share of families in each state able to afford 4-year-old care. Child care subsidies are the primary vehicle for making child care available to some low-income families. The Child Care Development Fund (CCDF), authorized under the Child Care and Development Block Grant Act (CCDBG), is the primary source of federal funding for child care subsidies for low-income working families. In 2016, total federal spending on CCDBG was $5.7 billion (Schmit and Walker 2016). Although CCDF is a single federal program targeting low-income families in each state, it functions as separate state programs in practice because states have considerable flexibility to set rules for how the CCDBG funds are distributed, including eligibility. For instance, many states set eligibility below the federal cap of 85 percent of the state median income (Walker and Schmit 2016). Key barriers to access for families who are income-eligible for CCDF funds include the limited number of subsidies, inability to afford copayments even with the subsidies, and, in some states, ineligibility for subsidies while job-searching. Among those eligible, only 11 percent access CCDF subsidies (U.S. GAO 2016). In addition to this “oversubscription,” copayments—the portion of the total cost of child care a family must pay out of pocket—have generally increased over time. Based on the 10 percent metric, required copayments are unaffordable for a family of three with an income at 150 percent of poverty in nine states (Schulman and Blank 2015). In addition to the child care subsidy program, publicly funded programs that offer free or low-cost early learning experiences provide this to only a fraction of their target population. For example, Head Start offers free early care and education services for young children in poverty, but reaches less than half of eligible preschool-age children. Early Head Start reaches less than 5 percent of eligible infants and toddlers (NWLC 2015). Forty-two states and the District of Columbia funded prekindergarten programs in the 2014–2015 school year, but these programs reached only 29 percent of 4-year-olds and 5 percent of 3-year-olds (Barnett et al. 2016). Child care quality depends on a number of factors, including facility quality, health and safety standards, and child-adult ratios. Quality also hinges on increasing acceptance of the notion that care providers are early educators. All early childhood services need to provide early enrichment as well as keeping children safe while their parents are at work. Thus quality care rests upon the knowledge, skills, well-being, and stability of the educators responsible for delivering early care and education. Most people in the field recognize this and refer to child care providers as early educators. The Institute of Medicine and the National Research Council of the National Academies have underscored the central role that these early educators play in service quality (IOM and NRC 2015). The report also concludes that the failure to give care providers the support and education they need hurts society, stating that “adults who are underinformed, underprepared, or subject to chronic stress themselves may contribute to children’s experiences of adversity and stress and undermine their development and learning.” Accordingly, the Institute of Medicine recommends setting qualification levels for early care providers, under which entry-level workers need to possess foundational knowledge and lead teachers must have a bachelor’s degree as well as specialized knowledge and competencies (IOM and NRC 2015). These recommendations are applied across all settings, including those serving infants and toddlers and those serving preschool age children. To date, no states have qualification systems in line with these recommendations. Across and within states, there are varying qualifications for regulated home-based programs, center-based child care, and public preschool teachers; fewer than a dozen states set consistent entry-level requirements across licensed settings (Whitebook, McLean, and Austin 2016a). Other qualifications set by the federal government for military child care, Early Head Start, and Head Start programs add further complexity to the array of requirements in a given community (Whitebook, McLean, and Austin 2016b). For example, in a given community, the required qualifications for a preschool teacher may range anywhere from no or minimal training or education to a college degree, depending on the funding source for the program in which he or she is employed, rather than the development needs of the children. Most educators working with children from birth to age five are not expected to possess professional qualifications. These persistently low expectations perpetuate the false notion that teaching in early education is low-skilled work. This notion has in turn made early education a generally low-wage profession with little opportunity for additional training or advancement. But even when teachers have achieved higher levels of education, including college degrees, as they have in Head Start and many public and private preschool programs, wages remain low and are a fraction of what similarly educated teachers of older children and those working across occupations earn (Whitebook, McLean, and Austin 2016a, 15). In fact, those classified by the Bureau of Labor Statistics as child care workers, and those classified as preschool teachers, are among the country’s lowest-paid workers, and they seldom receive job-based benefits such as health insurance. The median hourly wage for child care workers is $10.31, almost 40 percent below the $17.00 median hourly wage of workers in other occupations (Gould 2015). These low wages fuel economic insecurity among the early care and education workforce. Studies have demonstrated high levels of worry about paying for food and housing costs among early educators (Whitebook, Phillips, and Howes 2014; Whitebook, King, et al. 2016). Indeed, one in seven child care workers (14.7 percent) live in families with incomes below the official poverty line, compared with 6.7 percent of workers in other occupations (Gould 2015). And, close to one-half of child care worker families—a rate that is nearly double the national average for the U.S. workforce as a whole—accessed at least one federal income support (Whitebook, McLean, and Austin 2016a). Employers of all types know that to attract and retain the best workers, they need to offer more competitive compensation. The child care and education profession is no exception. We need to create targets like those that exist for other high-skill professions, and not rely on substandard expectations of workers who may excel under difficult circumstances, but can’t be expected to do the work simply as a mission. Some of the consequences of the current early child care and education system have already been touched on: low- and middle-income families are so stretched by child care costs that many can’t make ends meet, and child care workers struggle to get by as well because of low pay—with 15 percent living in poverty. Another consequence deserves special attention. Disparate access to high-quality early care and education contributes to striking achievement gaps between children from high- and low-income families. 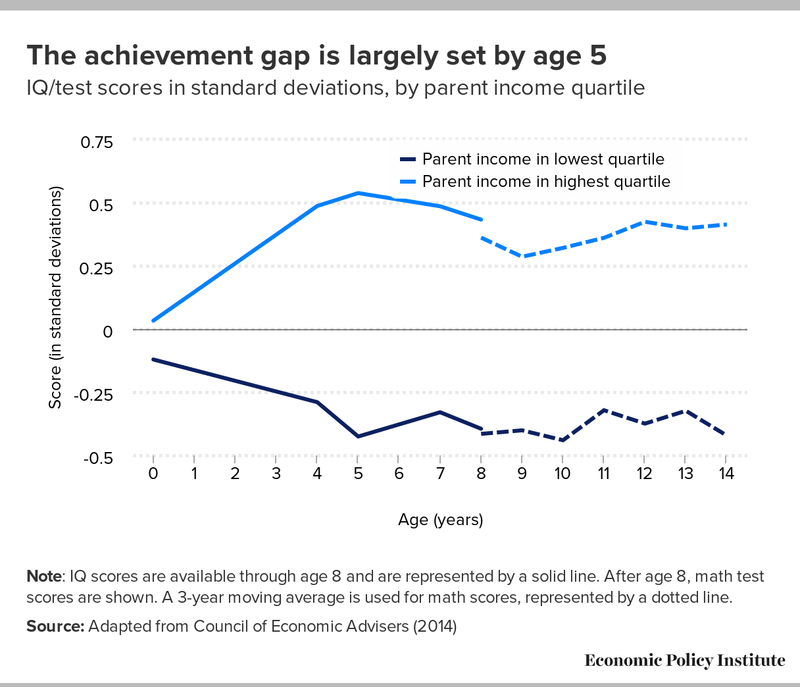 As shown in Figure D, these achievement gaps grow from birth to about age 5 and then remain relatively constant as children age. When they enter kindergarten, the most socioeconomically disadvantaged children lag substantially not only in reading and math skills but also in noncognitive skills such as persistence and self-control, which also affect achievement throughout a person’s life (Garcia 2015). It is clear that efforts to close these gaps must include high-quality childhood educational practices that provide school-readiness well before K–12 education actually begins, whether by parental investments or through high-quality child care experiences. The consequences of inequitable access and uneven quality of early care are borne by the economy in terms of preparedness of the workforce, but also by children and their families. In today’s system, the care and education a young child receives is dependent upon what his or her family can afford and has access to, and not upon his or her developmental and learning needs. The current system drives inequities from birth, and undermines the capacity of quality early care and education experiences to foster lifelong and healthy development. If a policy fails to sufficiently address these questions, then it is unlikely to be very effective at solving the core problems with the early child care and education system today. Each of these three components are necessary to ensure that high-quality child care and education are accessible and affordable for families across the country, at all levels of income, across racial and ethnic groups, and in rural and urban areas alike. A public investment is required to tackle both affordability and quality. The text that follows details how to use these questions to assess potential policies and assesses a few proposed and existing policies. Problematic proposals provide leave that meets the needs of just some types of families. Providing short-term disability insurance payments to mothers after the birth of a child is absolutely essential, but is not enough. Proposals to provide mothers who are giving birth a small portion of their full pay while they are on leave would not allow for recovery after birth and would do nothing for adoptive mothers and new fathers. While birthing mothers often need the leave to care for their own health, time for bonding and caretaking by all parents is also essential for the best childhood outcomes (Shonkoff and Phillips 2000). Promising proposals are efficient and well-targeted and address the needs of families most in need. Problematic proposals disproportionately target benefits to the most well-off. The Child and Dependent Tax Credit (CDCTC) is an example of a policy that is problematic. It allows parents to report up to $3,000 per child in child care costs (up to $6,000 total) and receive a tax credit of 20 percent to 35 percent, or up to $2,100, based on their adjusted gross income. Despite its progressive structure, the federal CDCTC provides little benefit to low-income families because it is nonrefundable, meaning families with little or no tax liabilities are unable to receive it.4 This shortcoming of the credit means it cannot be used by well over a third of the lowest-income households. And tax credits are less practical for cash-strapped low-income families because the benefits are only available when or if a family files an income tax return, rather than at the time the expenses are incurred. The employer-sponsored dependent care flexible spending account allows an employee to exclude from taxation up to $5,000 of his or her salary, regardless of the number of children receiving care. Since these are pretax dollars, higher-income families typically benefit more from the exclusion than from the tax credit because they save both on income and payroll taxes.5 Proposals that draw on the tax system in these ways exacerbate their regressivity. Problematic proposals do not provide adequate guidance or resources to invest in the workforce. The 2014 reauthorization of the Child Care Development Block Grant included provisions to ensure the health and safety of children in child care settings and improve the quality of care, with a small set-aside for training to improve the skills of providers. But increasing standards without making the necessary financial investments will not help much. The 2014 reauthorization did not include a significant increase in federal funding; states were therefore burdened with the challenge of having to make difficult tradeoffs in order to meet the new objectives (Matthews et al. 2015). And as has been the case for decades, the funding levels remain inadequate to improve early childhood educator qualifications and compensation. Unfunded mandates without adequate resources will be ineffective. Reform proposals that increase qualification standards without corresponding investments for improving compensation, and without access to education and training to meet those higher qualification standards, fall short of any standard for high-quality child care reform. The early education and care program for the military, subsidized by the Department of Defense (DOD), is an example of a policy that includes many of the necessary components for success. It serves as a much better model for what we should pursue than do the insufficient policy proposals examined above. How does the DOD program stack up in answering our three essential questions? 1. Does the policy allow all parents the option to stay home with their infants, newly adopted children, or new foster children? Somewhat. The military provides 12 weeks continuous paid maternity leave for all uniformed service members (Ryan 2016). Unfortunately, new fathers are only paid for 14 days of paternity leave. On the whole, this amount of parental leave is a move in the right direction, but it is still insufficient for parents (mainly fathers) who want to stay home with their young children for a more extended period. 2. Does the policy relieve the cost burden of early child care and education for low- and middle-income families? To a great extent. Subsidies for child care are provided to families on a sliding scale (CCAA 2017b). In general, families’ contributions cap out at around 12 percent of family income irrespective of the number of children in child care. In addition, the military provides for 12 hours of subsidized child care a day, in recognition of parents’ often long working hours (Ryan 2016). 3. Does the policy improve quality by investing in the early care and education workforce? Yes. The military sets early childhood teachers’ salaries at a rate of pay equivalent to those of other Department of Defense employees with similar training, education, seniority, and experience. Further, the military child care program has a well-articulated career ladder and provides resources to ensure that education and training to meet higher qualifications are accessible and affordable. Over the first 25 years that this policy has been in place, the base pay of new hires among early childhood teaching staff in military child development centers has increased by 76 percent, and turnover has plummeted (Whitebook, Phillips, and Howes 2014). Using the three questions outlined above, we can easily weed out proposals that fail to contain the essential components of a successful early child care and education reform program. Policy proposals that are insufficiently funded cannot, by definition, pass the test. Policies backed by unfunded mandates or that rely on the small amount of money that could be generated by eliminating what little waste, fraud, and abuse exists in the unemployment insurance system are simply insufficient to deal with the magnitude of the problems in the child care system today. Effective policy solutions need to break the link between what people pay and what early child educators earn. If quality is based solely on what people can afford to pay, then early educators will continue to subsidize the services through their low pay—and the quality of service will suffer as a result. Therefore, solutions need to be sufficiently funded to attract and retain a skilled workforce, and the subsidy scheme needs to sufficiently relieve families’ burdens. While there are some efforts aimed at providing more affordable and quality early care and education to a broader swath of American children, the system is currently insufficient to address the realities of 2017 family economics and to reflect what we know about the science of early learning and development. Quality child care access and affordability is a particular hardship for low- and moderate-income families, and policies should address both the size and the scope of this problem. The current child care and education system is too uneven in quality and access and requires further investments to live up to its potential. Increasingly researchers and policymakers are regarding these investments in the system as infrastructure investments, because an effective child and early education system supports not just families but the economy and society overall. For this reason, those concerned with making this “infrastructure investment” in American’s children and families are looking to innovations that have become commonplace in our advanced industrial peer countries (provision of universal affordable child care through subsidies, extensive prekindergarten programs, and paid family leave, for example) but have not yet arrived in the United States (OECD 2016). Because we lack adequate policies to support parents’ ability to remain in the labor force after having children, many parents—mostly mothers—drop out. This has important ramifications for their future work prospects, including their career path and earnings potential. Likewise mothers’ career paths and earnings have implications for family income levels and well-being and the economy as a whole. Lastly, it should not be overlooked that nearly 2 million adults, mostly women, are currently paid to provide early care and education services to more than 12 million children across the country (U.S. Census Bureau 2013; NSECE 2013). If these jobs were properly rewarded, they could be a desirable form of employment in every community. All of this should be addressed with a major infrastructure investment in America’s children and families. Anything less will continue to shortchange our future. Elise Gould, senior economist, joined EPI in 2003. Her research areas include wages, poverty, economic mobility, and health care. She is a co-author of The State of Working America, 12th Edition. In the past, she has authored a chapter on health in The State of Working America 2008/09; co-authored a book on health insurance coverage in retirement; published in venues such as The Chronicle of Higher Education, Challenge Magazine, and Tax Notes; and written for academic journals including Health Economics, Health Affairs, Journal of Aging and Social Policy, Risk Management & Insurance Review, Environmental Health Perspectives, and International Journal of Health Services. She holds a master’s in public affairs from the University of Texas at Austin and a Ph.D. in economics from the University of Wisconsin at Madison. Lea J.E. Austin joined the Center for the Study of Child Care Employment (CSCCE) at the Institute for Research on Labor and Employment, UC Berkeley, in 2010. She has extensive experience in the areas of workforce development, public policy and administration, and early childhood leadership competencies and curricula. In previous roles she developed leadership programs in higher education and community settings, and implemented a large-scale initiative focused on attainment of college education. She has led multiple research projects including the Early Childhood Higher Education Inventory studies, and is a co-author of the Early Childhood Workforce Index report and Leadership in Early Childhood: A Curriculum for Emerging and Established Agents of Change. She holds a master’s degree in Public Administration from California State University, Hayward, and a master’s degree and Ed.D. in Educational Leadership from Mills College. Marcy Whitebook is the Founding Director of CSCCE at UC Berkeley, where her research focuses on the nexus of the relationship between good jobs for early educators and the quality of services available to children and families, and appropriate and accessible professional preparation for teachers. Prior to coming to UC Berkeley, she taught in early childhood programs for many years and was the founding Executive Director of the Washington-based Center for the Child Care Workforce (CCW), an organization she began in 1977 as the Child Care Employee Project. In addition to authoring numerous publications, Marcy has led several large-scale early childhood research projects, including the landmark National Child Care Staffing Study, which first brought public attention to the low wages and high turnover of child care teachers, and more recently Worthy Work, STILL Unlivable Wages, and the Early Childhood Workforce Index. She holds a master’s degree in Early Childhood Education from UC Berkeley and a Ph.D. in Developmental Studies from the UCLA Graduate School of Education. 1. The Family and Medical Leave Act (FMLA) allows eligible employees to take up to 12 weeks of unpaid, job-protected leave within a calendar year for a serious health condition, the birth of a child, or to care for a newly born, adopted, or foster child, or to care for an immediate family member with a serious health condition. 2. Because these statistics come from different surveys, they are not strictly comparable. 3. Cost estimates are for center-based care in metropolitan areas and home-based care in rural areas. 4. There are many reasons families would have little or no tax liabilities: parents could be working and be very low income or could be in school or looking for a job. 5. While both low-wage and high-wage families pay payroll taxes, higher-income families generally pay higher marginal tax rates. So while middle-wage families also benefit, high-income families benefit the most from flexible spending accounts because those with the highest marginal tax rates benefit the most. Barnett, W. Steven, Allison H. Friedman-Krauss, Rebecca E. Gomez, Michelle Horowitz, G.G. Weisenfeld, Kirsty Clarke Brown, and James H. Squires. 2016. The State of Preschool 2015: State Preschool Yearbook. National Institute for Early Education Research, Graduate School of Education at Rutgers. Bivens, Josh, Emma Garcia, Elise Gould, Elaine Weiss, and Valerie Wilson. 2016. It’s Time for an Ambitious National Investment in America’s Children: Investments in Early Childhood Care and Education Would Have Enormous Benefits for Children, Families, Society, and the Economy. Economic Policy Institute. Bureau of Labor Statistics (BLS) (U.S. Department of Labor). 2016. “Leave Benefits: Access” [Employee Benefits Survey data table]. March. Center for the Study of Child Care Employment (CSCCE). 2016. The Early Childhood Workforce Index. Child Care Aware of America (CCAA). 2017a. Parents and the High Cost of Child Care: 2016 Report. Child Care Aware of America (CCAA). 2017b. 2017 Child Care Fee Assistance Total Family Income Categories, DoD Parent Fees, High Cost Installations, and Provider Caps. Economic Policy Institute. 2016. “Cost of Child Care” [interactive graphic]. Last updated April 2016. Garcia, Emma. 2015. Inequalities at the Starting Gate: Cognitive and Noncognitive Skills Gaps between 2010–2011 Kindergarten Classmates. Economic Policy Institute. Gault, Barbara, Heidi Hartmann, Ariane Hegewisch, Jessica Milli, and Lindsey Rechlin. 2014. Paid Parental Leave in the United States: What the Data Tell Us about Access, Usage, and Economic and Health Benefits. Institute for Women’s Policy Research. Gould, Elise. 2015. Child Care Workers Aren’t Paid Enough to Make Ends Meet. Economic Policy Institute. Gould, Elise. 2016. “DC Paid Leave Bill is a Step in the Right Direction” [press release]. Economic Policy Institute, December 20. Gould, Elise. 2017. The State of American Wages 2016: Lower Unemployment Finally Helps Working People Make Up Some Lost Ground on Wages. Economic Policy Institute. Gould, Elise, and Tanyell Cooke. 2015. High Quality Child Care Is out of Reach of Working Families. Economic Policy Institute. Institute of Medicine and National Research Council (IOM and NRC). 2015. Transforming the Workforce for Children Birth through Age 8: A Unifying Foundation. Washington, D.C.: The National Academies Press. Jorgensen, Helene and Eileen Appelbaum. 2014. Expanding Federal Family and Medical Leave Coverage: Who Benefits from Changes in Eligibility Requirements? Center for Economic and Policy Research. National Association for the Education of Young Children (NAEYC). 2017. “Child Care and Development Block Grant.” Accessed March 2017. National Survey of Early Care and Education Project Team (NSECE). 2013. Number and Characteristics of Early Care and Education (ECE) Teachers and Caregivers: Initial Findings from the National Survey of Early Care and Education (NSECE). OPRE Report #2013-38, Washington D.C.: Office of Planning, Research and Evaluation, Administration for Children and Families, U.S. Department of Health and Human Services. Organization for Economic Co-operation and Development (OECD). 2016. OECD Family Database [database]. Directorate for Employment, Labour and Social Affairs. Ryan, Missy. 2016. “Pentagon Extends Maternity and Paternity Leave for Military Families.” The Washington Post, January 28. Schmit, Stephanie, and Christina Walker. 2016. Disparate Access: Head Start and CCDBG data by Race and Ethnicity. The Center for Law and Social Policy. Shonkoff, Jack P., and Deborah A. Phillips, eds. 2000. From Neurons to Neighborhoods: The Science of Early Childhood Development. Washington, D.C.: National Academies Press. U.S. Census Bureau. 2013. How Do We Know? Child Care: an Important Part of American Life [infographic]. U.S. Department of Health and Human Services (U.S. HHS). 2014. “Fun”damentals of CCDF Administration. U.S. Department of Health and Human Services (U.S. HHS). 2015. Child Care and Development Fund (CCDF) Program; Proposed Rule, vol. 80, no. 247. U.S. Government Accountability Office (U.S. GAO). 2016. 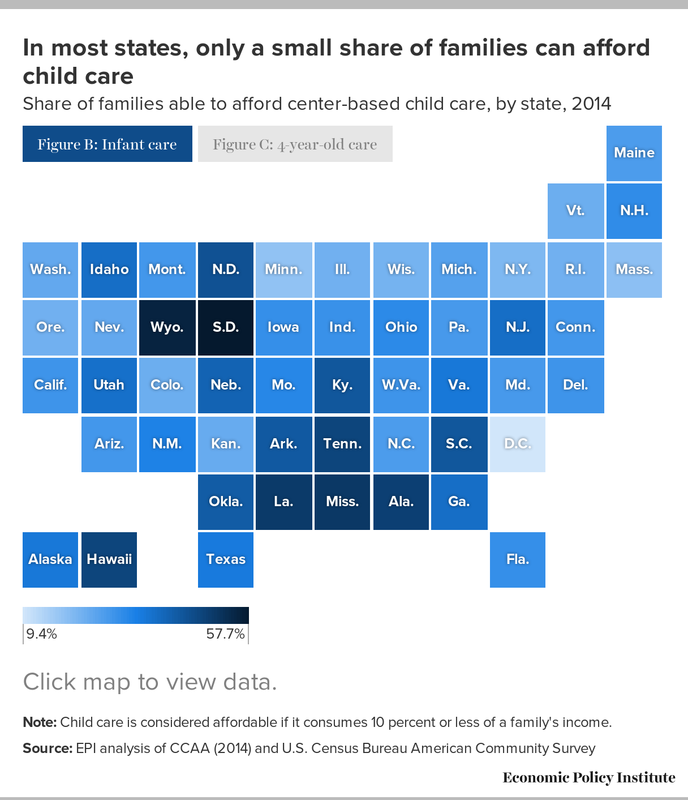 Child Care: Access to Subsidies and Strategies to Manage Demand Vary Across States. Walker, Christina, and Stephanie Schmit. 2016. A Closer Look at Latino Access to Child Care Subsidies. The Center for Law and Social Policy. Whitebook, Marcy, Elizabeth King, George Phillip, and Laura Sakai. 2016. Teachers’ Voices: Work Environment Conditions That Impact Teacher Practice and Program Quality. Center for the Study of Child Care Employment, University of California, Berkeley. Whitebook, Marcy, Caitlin McLean, and Lea J.E. Austin. 2016a. Early Childhood Workforce Index—2016. Center for the Study of Child Care Employment, University of California, Berkeley. Whitebook, Marcy, Caitlin McLean, and Lea J.E. Austin. 2016b. Early Childhood Workforce Index—2016 [interactive map]. Center for the Study of Child Care Employment, University of California, Berkeley. Whitebook, Marcy, Deborah Phillips, and Carollee Howes. 2014. Worthy work, STILL Unlivable Wages: The Early Childhood Workforce 25 Years after the National Child Care Staffing Study. Center for the Study of Child Care Employment, University of California, Berkeley.